There have been a few cards now that seem like they want to go with a block that's only slightly too far away to be part of Standard at the same time as the card. I guess this is a not-so-subtle way of reminding us that it's fun to play with cards other than the most recent ones? As it happens, it actually is fun to play with old cards, and Hellkite Tyrant is in an interesting position, as he provides both incentive to play with one or both Mirrodin blocks and a powerful weapon against people who do so. There are several ways to use him as an alternate win condition, ranging from the obvious mana-producing artifacts to Nuisance Engine, and although he's slower than most Affinity-themed decks, a single attack destroys their game plan in particularly hilarious fashion. Welcome back readers todays card of the day is a purely casual card. In standard a 6/5 six mana with trample isn’t bad just not good enough to compete with what some other decks are doing. The artifact clause is highly irrelevant because even having half of the required amount on the board almost never happens relegating this card to a niche attacker that doesn’t compete with most other available options. In modern, legacy, and vintage this card is outclassed by almost anything and while the artifact clause may be more relevant this doesn’t fit into any decks. In casual and multiplayer this card could become pretty insane providing a solid and aggressive attacker as well as an alternate win condition more easily achieved. The fact multiplayer games often have more artifacts allows you to horde some really powerful artifacts and disrupt opponents. In limited it’s a bomb a powerful flying trample body that can end games quickly if not dealt with. The ability to steal artifacts can randomly be relevant as well. Overall a card with powerful casual and multiplayer applications. 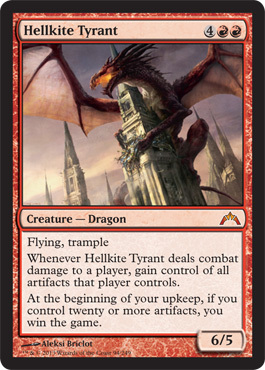 Today's card of the day is Hellkite Tyrant which is a six mana Red 6/5 with Flying, Trample, that grants you control over all of a player's artifacts whenever it deals combat damage to them and you win the game if you control twenty or more artifacts. The artifact win condition is really unlikely outside of a very specialized deck, but a six mana 6/5 with evasion and Trample is certainly impressive with the added bonus of stealing artifacts making it one of the better non-Hasted dragons. In Limited this is a major bomb, particularly as the multicolor nature of guilds encourages the use of almost any available artifact. The double Red keeps this from just being splashed in non-Red guilds, though any deck with access to a few sources of Red mana should definitely be running this for the Flying and Trample alone. A very easy first pick in Booster and clear choice for Sealed whenever possible. Oooohhhhh....fattie dragon! There's no reason to not play in sealed - he's a 6/5 flying trample for 6. His first ability might be neat, his second irrelevant. In draft, heck, why not. He might get some fun things done. In constructed he's a sideboard card against some weird deck that might appear. As I stated earlier this week, there are plenty of other things I'd like to play at the 6 slot. The only exception would be if you're trying to build a deck that utilizes the second ability to win the game. I think it's more Timmy or Spike than Johnny, but fun.